A new aerial tour of Star Wars: Galaxy's Edge provides a comprehensive look at the immersive upcoming area of the park. 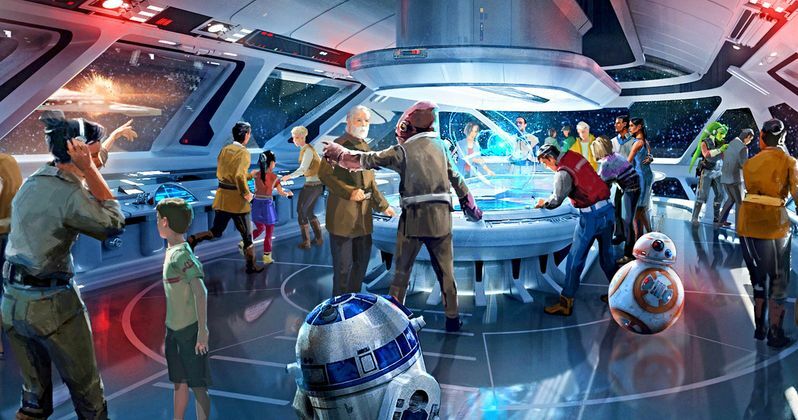 Disneyland in California and Disney World in Florida are preparing to open their Star Wars themed areas, with the California park debuting this summer and the Florida park debuting in the fall. At Disneyland, the latest addition to the park spans 14 acres and it looks truly massive in a recent drone tour conducted over the construction process. One of the major takeaways from the drone tour over Galaxy's Edge has to be the Millennium Falcon. Even though we have seen the iconic ship in official images from Disney, there's something that's just pretty cool about seeing it take up so much landscape in the Anaheim, California park. Other awesome looking domed structures of the Black Spire Outpost on Batuu are featured and many are still under construction, but it's pretty remarkable how quickly construction workers have been able get the area ready for the public. Disneyland visitors will be able to pilot the Millennium Falcon when the new area opens this summer. It's yet to be determined if the ride will allow visitors to stand in line or if it will be Fast Pass only (or even possibly the MaxPass), but there are rumors that it will only be available for fans who utilize the Fast Pass to schedule their visit, which is probably for the best since the wait time is estimated to be over 6 hours when Star Wars: Galaxy's Edge opens. Some of you are going to have to bring a lot of pie to keep content. Fans looking to get their first peek at the new immersive world may want to wait for crowds to die down. Another new ride will put Disney park goers into a battle between the First Order and the Resistance, which looks really cool. Disneyland and Disney World are expected to receive a lot of extra traffic when the Star Wars area of both parks opens. Florida visitors will be treated to a new resort that takes the immersive experience up a few notches and has it last over the course of a few days. Star Wars fans will be able to drink booze and workout at a gym with some of their favorite characters from the franchise. Even though the park is still under construction, the drone tour offers a pretty unique view into all of the hard work that has been put into the project over the last year. Somehow, seeing the Millennium Falcon never gets old, so it's going to be a real treat when Star Wars fans are able to get up close to the iconic bucket of bolts. It's going to be a pretty amazing time for both parks when Galaxy's Edge opens. But it could end up a nightmare for fans who are not prepared for the massive lines and wait times. You can check out the drone tour below, thanks to the Fly Rogue Vimeo channel.